The Underwoods are about as far from Ozzie and Harriet as you could get. As a power couple, their lust for power knows no bounds. They’ve proven that nothing is out-of-bounds, and they will do pretty much anything to get and keep power. What makes this interesting is that, while Frank relies on Claire, Claire resents having to rely on Frank. Even more interesting, she wants her role in here husband’s administration as something like a “co-president” (Where have we heard THAT before, eh?) and is righteously pissed when she realizes it isn’t. She doesn’t want to be First Lady and the power behind the throne…she wants the throne for herself. This makes for some fascinating TV, but I watched the final episode for this season wondering, “Is she crazy?” I think it was Lincoln who quipped “A man can accomplish almost anything, as long as he doesn’t care who gets credit for it.” In much the same way, Claire Underwood is chaffing at the fact that it’s her husband that is the President, and she is nearly an appendage. I get it. But you play the hand you’ve been dealt. And her hand is “First Lady.” Not VP. Not Co-President. I can’t wait for Season 4. Hell, Kevin Spacey could read a telephone book out loud for an hour, and I’d go to watch. He’s that good. The rest of the cast is…well, perfectly cast. Not a false note in the bunch. But I keep circling around to this: Frank Underwood may be a lying, cheating, manipulating, murdering politician, but he has the courage of his convictions, and is ALWAYS sensitive to his larger goals. 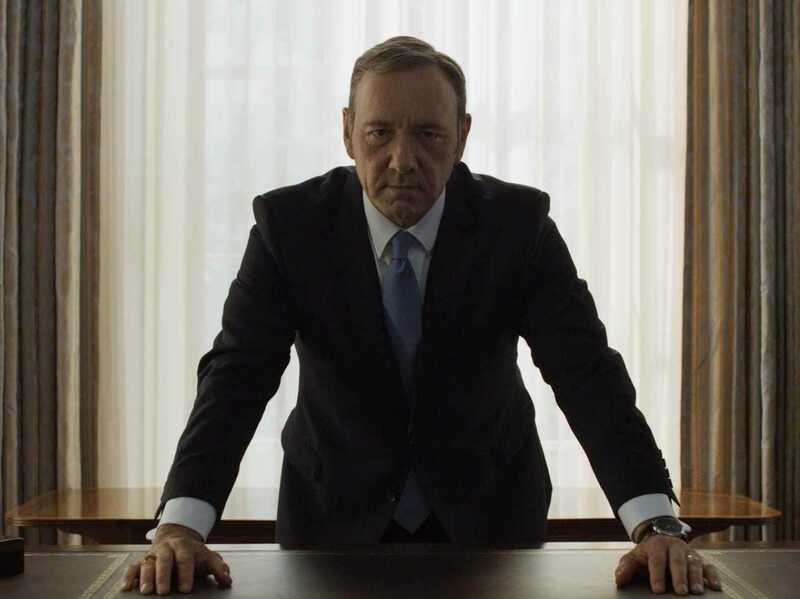 As played by Spacey, Underwood is a galvanizing figure: you either love him or hate him. But, by GOD, he’s not afraid to wield the reins of power, making bold moves, because he feels it’s the right thing to do. He’s corrupt, but not in the ways of today’s politicians that do their best to line their own pockets for fun and profit. Nope. He’s corrupt because he’s willing to bend or break any rule for the ‘greater good.’ Say what you will about this, I’d much rather have a President that’s willing to put ideology behind getting the job done any day of the week. That lead me to another thought. In the 80s, we saw a Renaissance in America, due to the influence and ideals of Ronald Reagan – an actor turned politician. Today, we’re living under the influence of a politician turned actor, Barack Obama, who seems to have run out of ideas, once his façade of “cool” slipped. Now the Dems seem to have fallen into the trap usually the fate of the GOP. They’re ready to nominate Hillary for President, not because she’s a charismatic leader (she’s not) a brilliant tactician (she’s not) or a can-do leader (don’t make me laugh). Nope she’s the presumptive nominee, BECAUSE IT’S HER TURN. DRAFT KEVIN SPACEY FOR PRESIDENT. If we’re gonna get lied to, I’d rather an actor who will make us believe the lies, than a politician pretending to be an actor, and failing miserably in the process. And Kevin…if you need a marketing guy…I’m available.